TOEFL JR is a new test by the ETS that is aimed at junior-senior high school students. Basically, the test is similar in level and difficulty to other tests such as TOEIC Bridge, Gtech, and STEP (Does anyone still use the STEP/Eiken?). 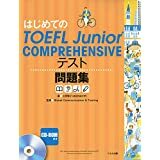 However, the strength of TOEFL JR is that it requires more output, and thus, tests your students’ English better than these other tests, in my opinion. For some reason, they have two kinds of tests: the TOEFL Junior Standard and the TOEFL Junior Comprehensive. While the standard is ok, the comprehensive is a much better test and is the best test of students studying English in junior / senior high school. So that’s the one I’m going to talk about (and also the one I wrote the book for). While the majority of points and time on the test are reading and speaking, to do well, students will need to output in speaking or writing. That in itself makes this test better than most. The other thing I like about the comprehensive test over others I’ve seen for students at that age is the content. It’s better. It is more realistic (STEP is awful in this regard), not overwhelming (like GTECH), and the usage and English is more modern. The reading and listening sections on the TOEFL Junior are on things students of that age would be studying: meteorology, natural science, and so on. And the classroom situations are realistic also. And, as you might expect, it is similar to the the format of the real TOEFL. So students who take the TOEFL Junior will be used to the format, so theoretically, they’ll do well on the TOEFL later. I’ll be going over the sections, with a few sample questions, in my next post. Check back later! What do you think of the TOEFL Junior? What is your opinion of the test? Do you like it? What do your students think of it? Have they tried it? Let me know your opinion.